It's hard to believe that I've been writing in this space for two and a half years now. That's a long time to journal about what I've been drinking and learning. My understanding of and appreciation for wine has grown since I started, and there are quite a few Tasting Notes on this site. 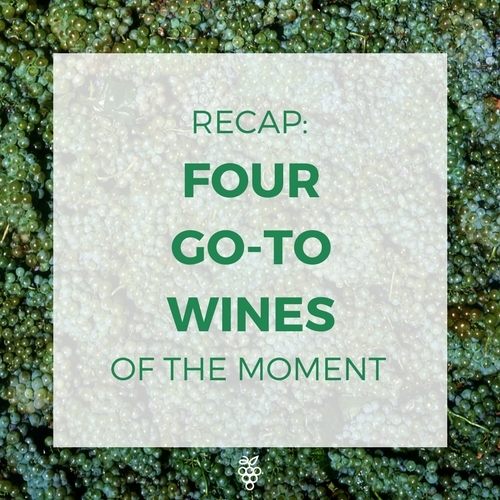 Because of this, I thought I'd sum up my top four go-to wine recommendations of the moment. My main goal with this list is value, so you won't necessarily see all four-bunch wines, but this way you'll be introduced (or re-introduced!) to a few of my favorites that you may have missed over the years. This Grenache (or Garnacha in Spanish) is food-friendly, fruit-forward, and light to medium body. I think it's a crowd pleaser! I typically purchase it at Total Wine, but I have started to see it pop up other places. This brand also makes a white that I've been curious to try. Now $8.99 a bottle, this wine is still a steal! See my full post here. This wine is my #1 go-to recommendation for anyone that is looking for a good value. It can be found anywhere, which is great because not everyone has access to local wine stores, Total Wine, or even more gourmet grocery stores like Whole Foods or Fresh Market. I have found it even in the smallest of towns when I was traveling for work. Full-bodied with dark fruit and pepper notes, this wine is going to please most red wine drinkers. See the full post here. Note: Gnarly Head has changed their label a bit, so the photo in the full post is not what you will find in store! Sauvignon Blanc is a great white to have around. It's crisp, refreshing, and typically works great for cooking, especially if it's a dish with lemon and herbs. I bought this at Harris Teeter, our local grocery chain, so my guess is you can find it at yours. With balanced acidity and grapefruit notes, this classic portrayal of Sauvignon Blanc will be great for the upcoming warmer weather. See the full post here. You all know I love my bubbly, and this one is a great affordable option! Available for $9.99 at Trader Joe's, this wine will bring fresh acidity with the typical notes of lemon and apple. This is perfect for brunch, festive parties, or just a regular Tuesday night! See the full post here. July 4th: What wine should I have with...? 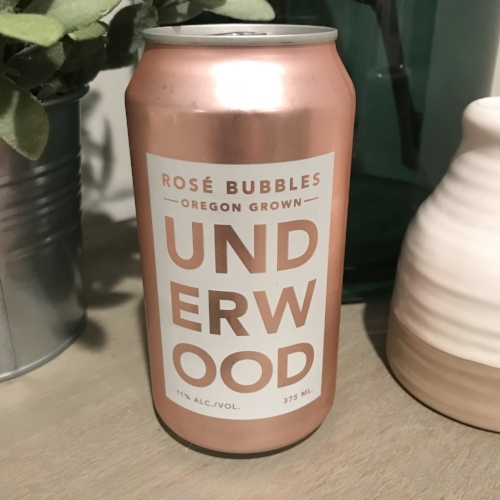 Last summer, I tried Underwood's The Bubbles canned wine and loved it. So when I saw that Whole Foods was now carrying the rosé version, I was pumped! Sparkling rosé is my favorite thing to drink at the moment, so this was right up my alley, and with the first version being surprisingly tasty, I had high hopes for this can. The company's notes read: Wild strawberry, fruit cocktail, and tart cherry. Carbonated wine. This says a lot and definitely set up my expectations for the wine. I expected it to have a sweetness to it, and I expected the bubbles to very fine. "Carbonated wine" means the carbonation was added similar to a soda, as opposed to most other sparkling wines being made through the traditional method or tank method where the bubbles integrate with the wine and become the wine. Both of those expectations were correct. I definitely got a sweet strawberry flavor and even a hint of bubblegum. The residual sugar was more apparent in the rosé version than the classic and it felt flabby, like there wasn't enough acid to balance the sweetness. After our Whole15, I have developed the habit of asking, "Is this worth it?" in relation to calories, sugar, alcohol, etc. In this case, I decided no. I did not find it pleasant to drink, and I could see the sugar giving me a headache later in the evening, so the can went unfinished. Overall, the wine fell very short of my high hopes. I'm not sure I'm totally on the canned wine train, but if I had to choose one, I'd go with the more classic "The Bubbles" version I reviewed previously. Tasting Notes: Underwood "The Bubbles"
It may be 2018, but I am still working through Total Wine's Top 20 of 2017, slowly but surely. I know I've mentioned this before, but I am always intrigued to try Cabernets at a more value price. Cabernet is such a popular (the most popular?) wine varietal, so I like to have a tasty, but affordable, option available for guests, and now readers! First, let me share with you what the bottle description says. I always love reading these because they're usually ridiculous marketing ploys, but I also like to see if I pick up on the same notes they identify. Wine bursts with plum and blackberry flavors, layered with vanilla, roasted hazelnuts, and a long finish supported by tannin. I absolutely got the blackberry notes in this wine. It smelled like really dark fruits, and perhaps, a little jammy. I am usually turned off by "jammy" wines because I think it's a sign that an inexpensive wine is trying to be "bold" with over-oaking, but there's nothing to balance it. This wine, however, was actually not that way. It was easy to drink, more medium-bodied than full-bodied with balanced tannin and a nice vanilla touch to it. Not a vanilla bomb! It went very well with our pot roast, but was also nice to drink on its own. I think this may be the relatively inexpensive Cab winner for the moment! 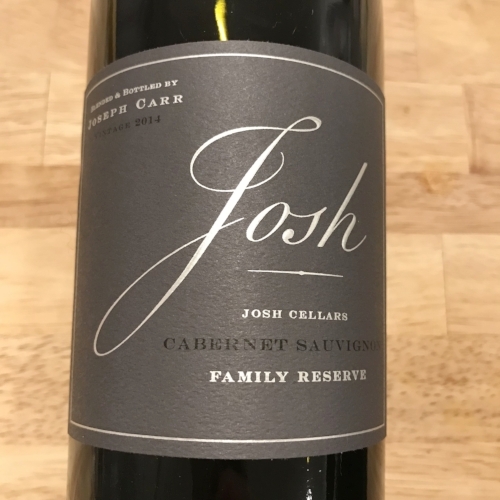 If you're headed out to a dinner party and want a more affordable wine to bring, I think this Josh Family Reserve is a great option! Ever since our trip to Italy, we have loved Italian wine. Oddly enough, though, we tend to not buy it. No idea why! So the last time we did a Total Wine bulk buy, I made sure at least one Italian bottle made it into the cart. This Chianti Classico Riserva was a top-selling bottle, so why not? First, I want to talk a little about what Chianti Classico Riserva means. Chianti, as you likely know, is a region within Tuscany that makes a particular type of wine per Italian law from the Sangiovese grape. The term "classico" indicates it's from an even smaller sub-region of Chianti, and it also indicates that the wine is a step above wines just labeled as Chianti due to additional restrictions and laws. Finally, "riserva" is even one more step above, and it is largely due to additonal time required to age in barrel. So theoretically, if you want the "best of the best" from Chianti, Chianti Classico Riserva is that wine. Again, theoretically. Now on to this specific bottle! I got this bottle because the description on the little paper at Total Wine sounded right up my alley... "intense, spice, cherry, medium-body". I like all of those things. I got black cherry and raspberry notes with a little bit of tobacco and cooked tomato. What I mean by cooked tomato is it smells similar to the start of a homemade marinara. This is very common for Sangiovese! Fruit, however, was definitely the more prominent aroma. I did not get any spice. Maybe I missed it, but I was definitely sad about that. I got a mouthful of acid, which again, is common for Italian wines, and I thought it lacked depth. I found this wine not great on its own, but very good with our spaghetti dinner. Chianti was made for tomato sauce! I think I may give this one another whirl because it's well-liked elsewhere, but for now, I'd give it two bunches. Calling all Chardonnay lovers out there! Pouilly-Fuisse may be difficult to pronounce (pwee fwee-say), but don't let the confusing name throw you off... it's Chardonnay! As some background, Pouilly-Fuisse is an appellation within the Macon sub-region in Burgundy, France. Uhhh... come again? French wine is confusing, but just think of Pouilly-Fuisse as a specific type of wine made in and named after a small part of southern Burgundy. Anyway, I wanted something that would go well with the chicken pot pie I picked up at Whole Foods, and Pouilly-Fuisse is known to go well with poultry, especially in a cream sauce. The first thing I noticed was that the wine was a yellow-gold color, darker than most whites I've had. It had notes of yellow apple and lemon. I also picked up on some almond on the nose, which may be from aging in oak. Most Maconnais Chardonnay is light and unoaked, but my understanding is that Pouilly-Fuisse (a smaller region within Macon) usually sees some oak. In reading Jadot's winemaking notes, a portion of the wine is fermented in vats, while another portion is fermented in oak barrels. This helps keep the crisp and fruity flavors, while also adding some body and weight to the wine. I have to say that it was a great choice for chicken pot pie. The creamy mouth-feel of the wine matched perfectly with the gravy filling, but there was enough acidity to cut through the richness. Overall, I really enjoyed drinking this wine, but for the price point, it wouldn't be my daily go-to. I would highly recommend having this for a party or bringing as a hostess gift. It is food friendly, and I think it would please both oaky Chardonnay and unoaked Chardonnay drinkers! What's the deal with Chablis?